Congratulations to Palo Verde High Magnet School's Optimal Robotics team, which traveled to Houston for the 2017 FIRST Robotics Competition and made it through the qualifying rounds. The team earned a berth at Worlds after winning the Western Regional Championship in early April 2017. The students worked for six weeks to build the robot, putting in more than 120 hours each after school, on weekends and during spring break. In addition to winning a place in the world competition in Houston, the team won the Engineering Inspiration Award, which included a $5,000 scholarship from NASA to help cover the entry fee. We are so proud of these young engineers, coached by teacher Ann Marie Condes. 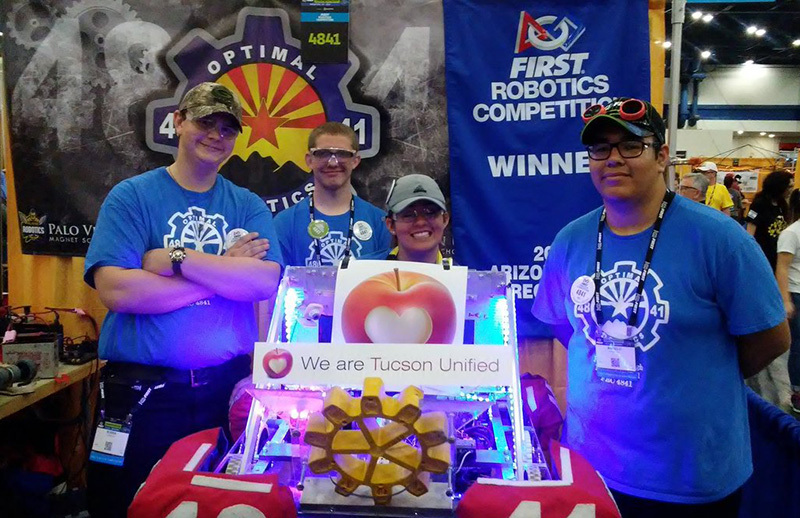 Here's what Dr. Gabriel Trujillo, interim superintendent of Tucson Unified, said after the team won regionals: "This is an amazing achievement for the Palo Verde community and all of Tucson Unified School District and a testament to the excellence of CTE programs. It's another reason why CTE needs to flourish across TUSD. This is also a testament to the effectiveness of an amazing teacher, Ms. Condes, and what high expectations and relationships will do to drive students to achieve."